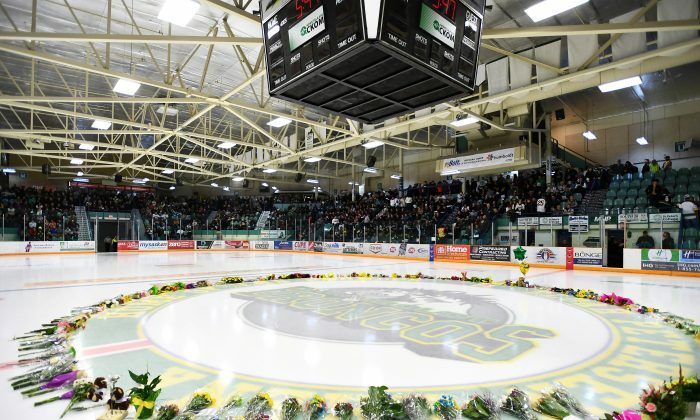 HUMBOLDT, Sask.—Elgar Petersen was famous in Humboldt, Sask., for his love and support of the Broncos hockey team, but it was in the wake of the tragic bus crash in April that his name suddenly became known across the country. It was also where Petersen’s death at the age of 82 was announced at a Broncos game on the night of Nov. 3, just after the singing of the national anthem. The Saskatchewan Hockey Hall of Fame says on its website that Petersen was a major contributor to all levels of hockey in Humboldt since the late 1960s. It says that during his time as a volunteer with Humboldt Minor Hockey, he was a coach, a mentor, and a player. Petersen was seen at the rink almost every day, sometimes for over 12 hours a day, it says. Petersen had been living in a care facility in nearby Cudworth, Sask., in the past few years, according to Muench. He was last in Humboldt for the prayer vigil, held in the arena that bore its name, two days after the Broncos’ bus collided with a transport truck at a rural intersection, killing 16 people and injuring 13 others. The Broncos played the Nipawin Hawks on Saturday—the same team they were on the way to face in a playoff game when the crash happened.